This is a very exciting and happy day for me because, Air - Fried Sweet Potato Fries are going to be my 800th post! 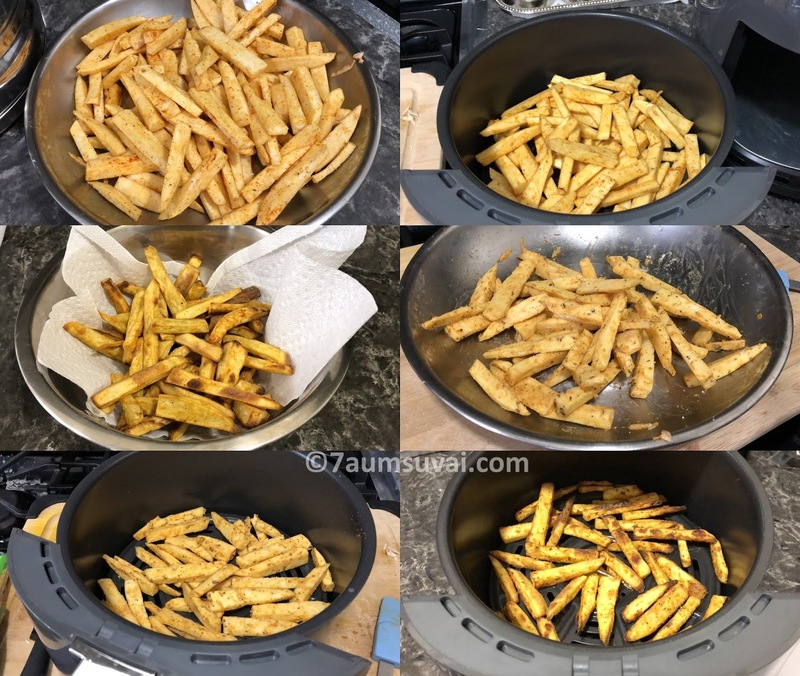 Making sweet potato fries using an Air-Fryer, it sounds interesting right! It also tastes great, is crispy and healthy too. 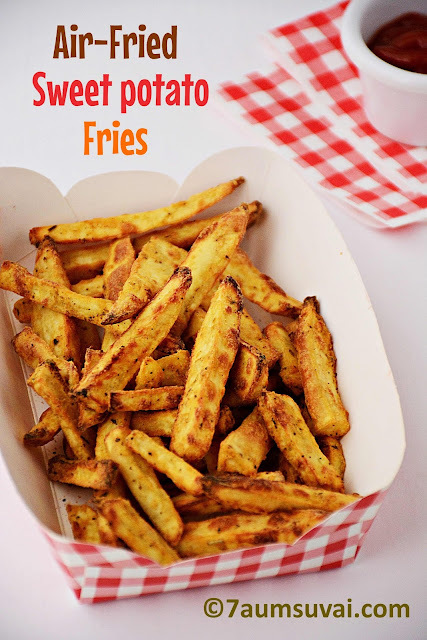 I prepare fries in two different ways, one with corn flour and herbs and along with spices and another one with just spices. Both of them came out good, but my choice was fries prepared with corn flour and herbs. 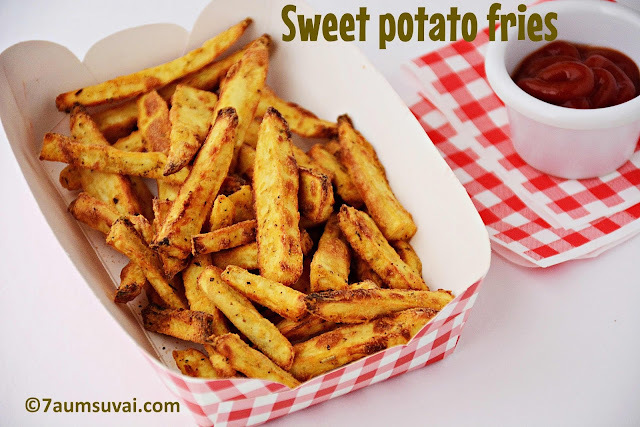 If you are craving for high fat and salty treat like fast food French fries, then try this recipe for a healthier version. 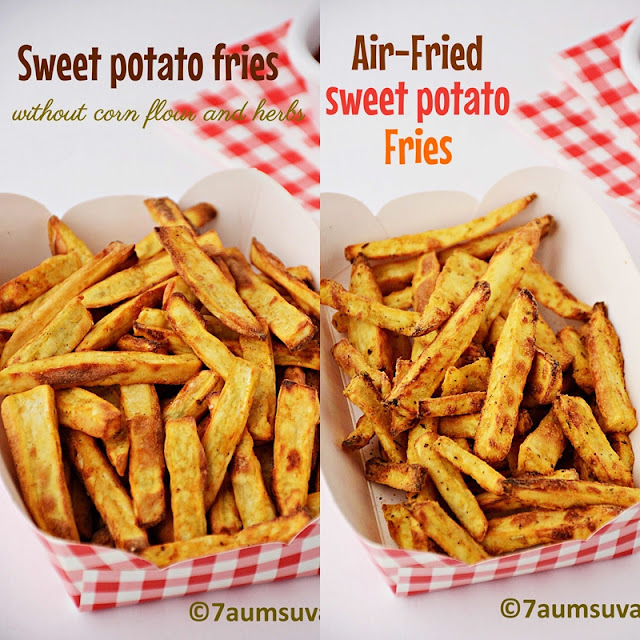 Air fried sweet potato fries are much lower in fat than deep fried ones and are very quick to prepare. Kids will love this recipe for sure. Wash the sweet potatoes thoroughly to remove all the dirt and peel the skin. Slice sweet potatoes into French fries, and place into cold water for 30 mins so they won't turn brown. 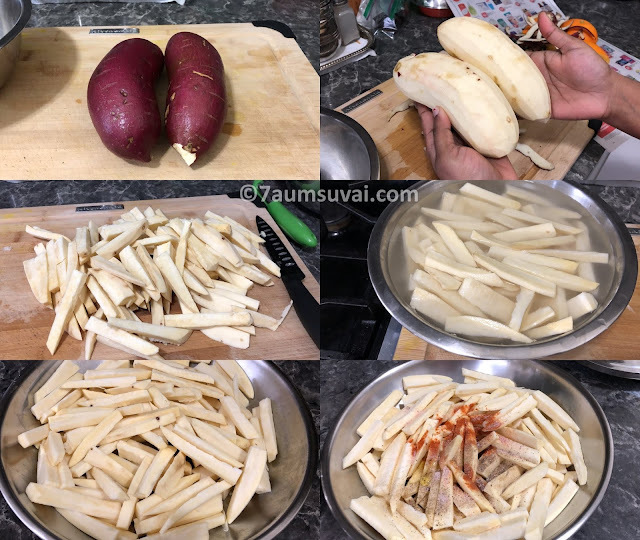 This step also gets rid of excess starch, resulting in fluffier and crisper fries. Drain the sweet potatoes and pat them dry with paper towels or a clean kitchen towel. Arrange them in a single layer to air-dry for a bit. The drier the better. Take a mixing bowl, toss together all ingredients except corn flour and mixed herbs until the sweet potatoes are evenly coated with oil and spices. Preheat the Air fryer over 390 F for 3 minutes (Air fryer option), place spiced sweet potatoes in a single layer on a crisper plate and air fry them for about 10 to 12 minutes or until done. Air fry them in batches, my first batch was sweet potatoes with just spices and in my second batch I added corn flour and mixed herbs to the spiced sweet potatoes. Air fry them until golden or starting to turn golden brown. Both the sweet potatoes were tasting good but, my choice was the second batch with flour and herbs. 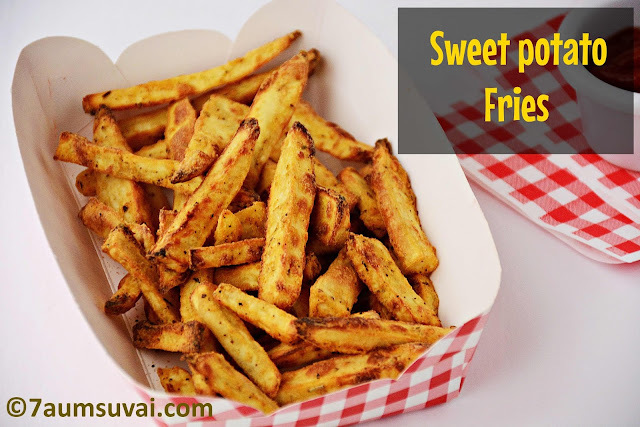 Easy and tasty sweet potato fries are ready. You can eat these fries plain, but you could serve with ketchup or a ranch dip etc. Enjoy your Air fries sweet potato fries. You can also deep fry or bake the sweet potatoes instead of Air frying . Do not over cook sweet potatoes as it will become dry and rubbery. It is completely optional to add corn flour and herbs to the spiced sweet potatoes.